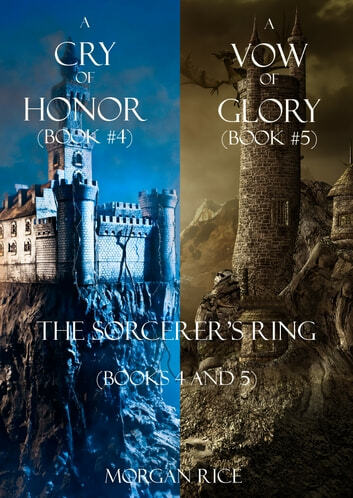 “THE SORCERER’S RING has all the ingredients for an instant success: plots, counterplots, mystery, valiant knights, and blossoming relationships replete with broken hearts, deception and betrayal. It will keep you entertained for hours, and will satisfy all ages. Recommended for the permanent library of all fantasy readers.”--Books and Movie Reviews. 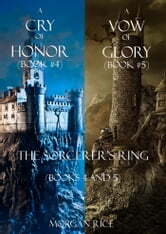 This bundle includes books #4 (A CRY OF HONOR) and #5 (A VOW OF GLORY) in Morgan Rice’s #1 Bestselling fantasy series THE SORCERER’S RING, a 17 book epic fantasy series with over 1,000 five star reviews. The series begins with A QUEST OF HEROES, a free download! In A CRY OF HONOR (Book #4 in the Sorcerer's Ring), Thor has returned from The Hundred as a hardened warrior, and now he must learn what it means to battle for his homeland, to battle for life and death. The McClouds have raided deep into MacGil territory—deeper than ever before in the history of the Ring—and as Thor rides into an ambush, it will fall on his head to fend off the attack and save King’s Court. In A VOW OF GLORY (Book #5 in the Sorcerer's Ring), Thor embarks with his Legion friends on an epic quest into the vast wilds of the Empire to try to find the ancient Destiny Sword and save the Ring. Thor’s friendships deepen, as they journey to new places, face unexpected monsters and fight side by side in unimaginable battle. They encounter exotic lands, creatures and peoples beyond which they could have ever imagined, each step of their journey fraught with increasing danger. They will have to summon all their skills if they are to survive as they follow the trail of the thieves, deeper and deeper into the Empire. Their quest will bring them all the way into the heart of the Underworld, one of the seven realms of hell, where the undead rule and fields are lined with bones. As Thor must summon his powers, more than ever, he struggles to understand the nature of who he is. With its sophisticated world-building and characterization, THE SORCERER'S RING is an epic tale of friends and lovers, of rivals and suitors, of knights and dragons, of intrigues and political machinations, of coming of age, of broken hearts, of deception, ambition and betrayal. It is a tale of honor and courage, of fate and destiny, of sorcery. It is a fantasy that brings us into a world we will never forget, and which will appeal to all ages and genders. All 17 books in THE SORCERER’S RING are now available! I just didn't want I to end. I wanted to fight with the characters. Advise them not to listen to the liars. I can't wait to get into the next book. I have to go now. My next book is downloading.